A logical look at real self defense. 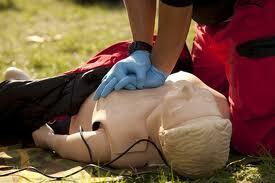 Find a qualified first aid course and take it. Work your way up to advanced level emergency life saving techniques. Take a second look at your fitness level; embrace a lifestyle of fitness and healthy eating. Take the leap of communicating your self-defense plans to your family. Ensure each member has an “If-then” plan. Address the weaknesses of your residence. This includes simple items like getting the kids to lock the doors, to higher-level security concepts. Find a qualified instructor that teaches quality empty-handed combatives, and train to a high level of skill with these techniques. Research and employ intermediate levels of force options. This might include chemical sprays, electric stun tools, and other items that would be used instead of lethal force. Research the crime trends in the areas that you frequent, and practice avoidance of those areas or awareness while in them. Educate your family members. Continue your education and training with your primary weapon system (handgun in this case), and get additional training with any additional weapons you might use for self defense (such as a home defense rifle). 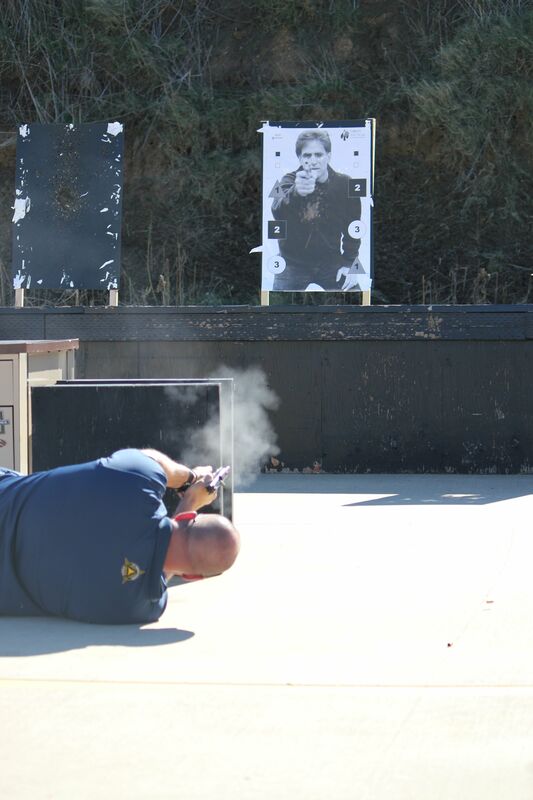 For those of us who really like to shoot, going to the range and training is easy and fun…but there are certainly other things you should be addressing that will complete your self-defense picture. 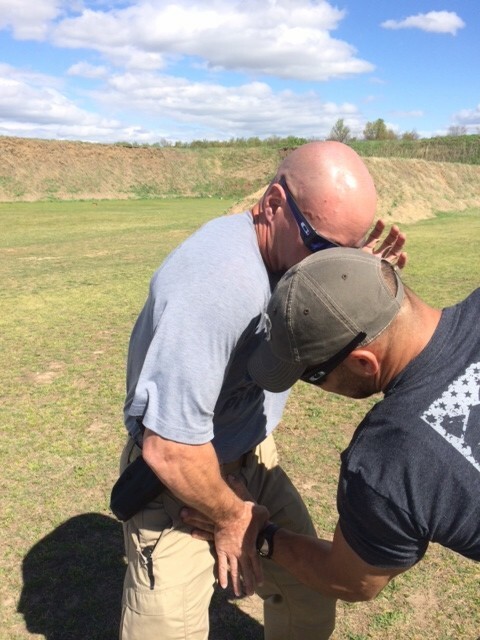 Are you shocked to find firearms related training last on the list? How can this be, coming from Mike Seeklander, the guy who promotes, teaches, and constantly tells you to train harder on the range? 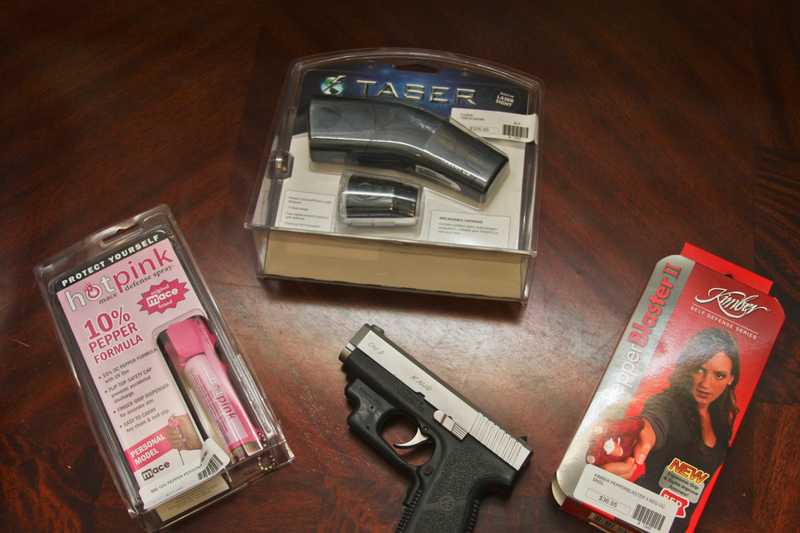 The simple answer is that there is much more to self-defense than just training to use a firearm. While that aspect is critically important, consider the likelihood of having to use your handgun to defend yourself versus the chance that you might have to perform a life saving first aid technique such as CPR or the Heimlich (choking victim) technique on a loved one. Imagine being well trained with your carry gun and having the ability to fend of any attacker only to have your child die because you did not have the first aid skills to save them! The second item on the list is fitness. Why? Simply because being physically fit will aid you in the fight… and even more importantly, heart disease is one of the number one killers in the U.S. Open your mind and consider that defending yourself is bigger than just getting a carry permit and going armed. I think you get the point, so let me break each area down in a bit more detail. This will allow you to address each concept, assess your plan, and do what is necessary to address your individual weaknesses. Some items on the list may not apply to you (or me), so pay particular attention to your weak areas and addressing them. emergency life saving techniques. This is one that has always scared me. I have always worried that something would happen to a family member and I would not be able to help them. I think I got real serious about the time I had my son as an infant, and knowing how fragile the little guy was and how different first aid was in reference to someone that age. I recommend starting simple in this step and simply taking a first aid course that can often be found in your area through the Red Cross. Often times these courses will be taught in the community or at a local college. Sometimes they are free, but most of the time they are cheap, and well worth the investment. Once you have secured the knowledge of simple first aid techniques, consider taking some advanced courses that might be more applicable to a situation where you had been involved in a high stress encounter and someone got severely injured. You never know, you might end up having to treat yourself. Take a second look at your fitness level; embrace a lifestyle of fitness and healthy eating. Heart disease is one of the leading causes of death in the U.S.. Imagine that! You are statistically much more likely to be effected by the choices you make in reference to diet and exercise than you are to be attacked and killed by an armed intruder. Yet most people continue to dump deadly levels of refined sugary foods and drinks into their bodies daily. I often run into “gun guys” who have a great excuse for being extremely overweight and out of physical shape by telling me that is why they carry a gun…because they are just going to shoot someone rather than fight them. First of all, it is not always that simple, and secondly those guys are much more likely to die at a much younger age due to complications caused by an unhealthy lifestyle. There is so much information out there about getting fit (at any age) and eating healthy it’s almost confusing. My recommendation is to follow the advice of a good trainer that understands your goal and is not just focused on “bodybuilding”. I spend the majority of my fitness time doing functional moves that directly compliment my combative skills. For example, spend thirty minutes hitting a heavy bag versus doing useless cario on a elliptical machine. I guarantee you the heavy bag will give you a workout! For more, check out The Ultimate Functional Fighting/Shooting Cardio Circuit. Take the leap of communicating your self-defense plans to your family. Ensure each member has an “If-then” plan. This is one area that is an absolute must and I have found is often ignored by most people who carry a gun. No communicating what you plan to do, and what you want them to do can have life threatening consequences. Imagine your child running into the line of fire and getting struck by you or the attacker if they did not know what to do in a high stress situation like an active shooter. The only way you can possibly expect them (your family) to act under this level of stress is to develop a plan and practice it. I recommend that you develop some simple communication phrases that will cause an immediate response from your spouse and/or children. Its also important that both you and they understand key tactical concepts such as the “line of attack”, and simple ballistics so that your family understands where they should not be during a shooting situation. Once you have your plan discussed, practice it in a controlled setting. Make sure you communicate to your family that you will never “cry wolf” and practice your plan in public, and that if you ever use your key phrase out and about, it will be for real. Something as simple as this suction cup can be used to leverage and open a sliding glass door. Have you tested the security of your home? kids to lock the doors, to higher-level security concepts. I am amazed at how often I have to remind my own family members to lock the front or rear doors while they enter the house. Often times I think that we get caught up in the “I live in a safe neighborhood” thought process and forget that predators prey on victims who are the most unprepared. If you visit the roughest parts of town, you will find street-smart families and people who have learned not to be a victim. In areas much like the one I live in, you find unaware residents who think the location of there home keeps them safe. This method of thinking often leads to the victim mentality where “it can’t happen to me.” Address the weaknesses of your residence. This might include unlocked doors and windows, garage doors that can be opened without a code or lock, sliding glass doors that are not locked properly, poorly lit areas that might hid an intruder, etc. Violent home invasions are not uncommon these days, and they happen in nice neighborhoods. Learn the trends and discuss how these predators prey on their victims and discuss the security measures you need to take with your family. 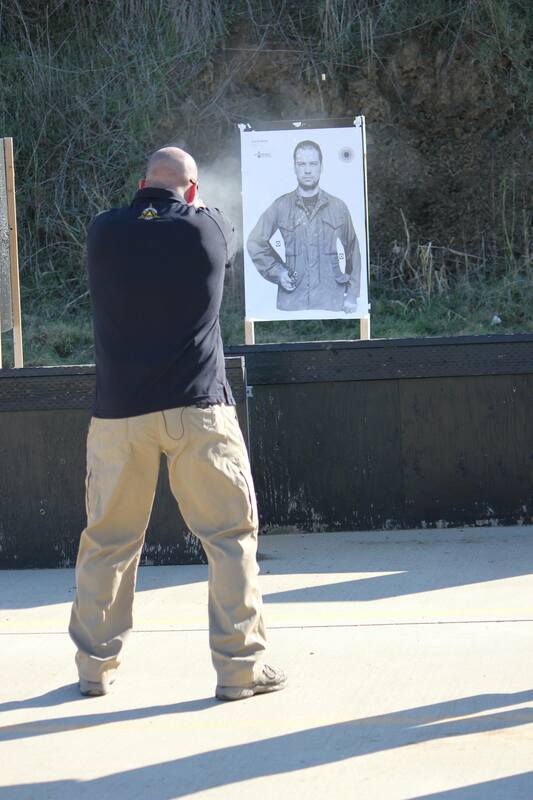 Integrating empty-handed skills and firearm skills is a complex process that relies on having a solid foundation of striking and grappling techniques. In this photo I am working on striking and shooting at the same time, an advanced skill that would allow me to defend my handgun from a grab yet still utilize it if lethal force was warranted. empty-handed skills. The ability to defend oneself against the physical attack at close range before weapons come out is a huge part of the equation. Getting the gun into the fight where there is justification also requires empty-handed skills at the closer ranges. One of the most important reasons to have solid empty handed skills is the ability to have a tool other than lethal force for certain situations. If I can deflect an attack utilizing unarmed skills and diffuse the situation rather than resorting to a weapon, that is going to be a win-win in any case. Another side benefit is the confidence I will possess by having solid unarmed skills allowing me the option make choices other than lethal force, if they exist. If possible, not using lethal force is always going to be the best choice. 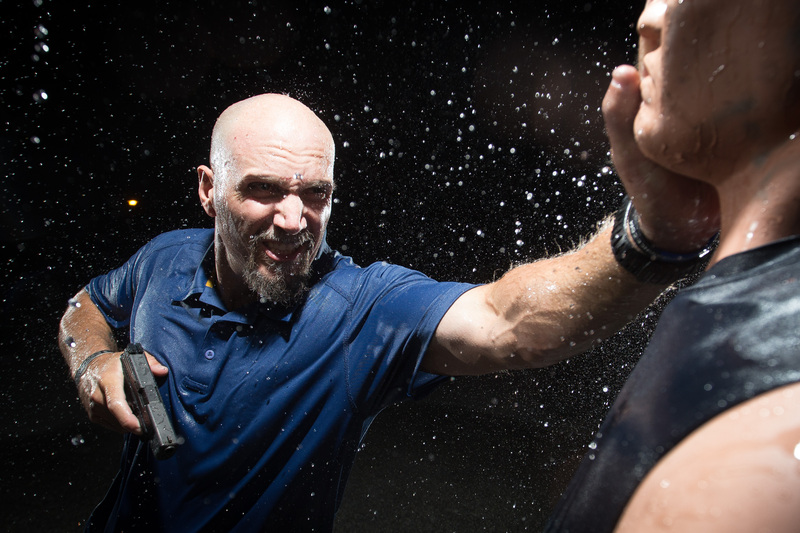 I strongly recommend that anyone serious about self-defense, and especially those that are less skilled with empty hand combatives, consider other force options such as chemical sprays and electronic stun tools. While lethal force may still be necessary, its nice to have the option to resort to something less deadly. solution to an aggressive assault that might not warrant deadly force at that moment. Not having something like that available limits your options and forces you to close with and use empty handed skills, move away and create distance (not always easy with small children), or resort to a firearm. Once again, having other options is my choice and if possible at all, I would recommend utilizing something that allows me to defend myself without using lethal force. Electronic stun devices are great tools in this area, but my last choice since they often times require such close proximity to use. I prefer an option that allows me to maintain more distance yet is still effective. Research the crime trends in the areas that you frequent, and practice avoidance of those areas or awareness while in them. Educate your family members. This is one that seems to be common sense, but that we often times forget. It seems that the only source of information we count on these days for pertinent facts is our local major media channels. You will be way ahead if you have a keen eye on the crime trends in your area, and specifically the locations they are occurring. An area that has a high number of violent assaults over a given period of time is one to be avoided, yet often times the news media will not tie those trends together well. Ii recommend contacting your local police agency to see if they track crime statistics (I can almost guarantee they do), and find out what data they can provide. Avoidance and awareness are terms we preach in training classes, but avoidance is the first step in the process, and to avoid anything you must first be aware of it. Remember that criminals are creatures of habit, and if they are preying on innocent victims in one area and having success, they will likely stick to that area. If you know where those places are, you can simply avoid them, or if you are forced to be there, practice increased awareness while so. Continue your education and training with your primary weapon system (handgun in this case), and get additional training with any additional weapons you might use for self-defense (such as a home defense rifle). Just because this one is last on the list, does not mean it is least important! I am a guy who strongly believes in training regularly. This means committing to a range visit weekly or at least utilizing dry fire or alternate methods of training such as an airsoft gun to hone or maintain your skills. Years ago as the lead instructor for the firearms program, I used to tell the graduating students in the Federal Air Marshal Academy classes to “take responsibility for your own survival”. I knew that they would have obstacles to overcome when they reached their field offices, and often times training takes a back seat to the mission. In your case, its easy to find excuses for your failure to train with your firearm/s, but in the end you will have to deal with the consequences. In closing, I hope you take some of these “self-defense” thoughts and act on them, as action is always stronger than intent. Most importantly, address your own self-defense strengths and weaknesses and step back and objectively look at areas that you might have previously forgot about. When I was encouraged to develop an if-then plan in the event of a home invasion, my children were really really young. So they understood it as a “fire drill” with staying low to the ground, crawling, getting out of the house and running to a rally point. Now that they are older, we’ve discussed different terms and more choices for “getting out of the house” on their own. But it is all still understood in terms of fire drill type expectations. As they continue to understand more and more, we adjust vocabulary and choices for their action plans but the main thing is- my kids have some situational awareness about self defense in the event of home invasion. As far as out and about, both were still really young when we were planning to travel on a long-distance road trip knowing we might have late-night stops at gas stations. So I hired a quality instructor and we practiced what they should do in the event someone meant us harm by our car. And this article made me realize I need to refresh their memories on other this and other scenarios “out and about.” So thank you for that! Sounds like a very well balanced plan to me! I find fault in many people’s approach to self defense in which they consider ONLY lethal force options,,, mainly the gun. Many internet forums are proof that folks are prepared to only shoot. No empty hand skills. No OC spray skills, etc. The steps you suggest if followed should help one to build & maintain a healthy defensive mindset. From my perspective, mindset is a very crucial element in my defensive lifestyle. How sad that many folks cheat themselves (unintentionally??) by assuming that training only happens on a gun range. Good job, keep the writings coming.